MK Oren Hazan attacks helplessness in face of terror, calls on government to act hard against terrorists including collective punishment. 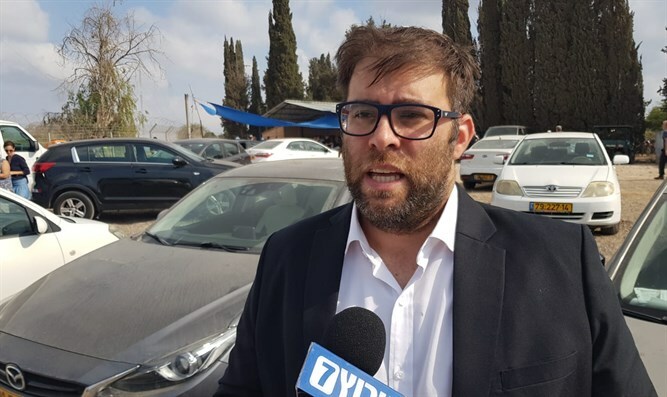 MK Oren Hazan (Likud), who participated in the funeral of Ziv Hajbi, attacked State leadership in an interview with Arutz Sheva, accusing it of being detached from the people and indifferent. "In less than 24 hours we bury another member of the Jewish People," says Hazan. "Yesterday I was at the funeral of Kim, Rinat my wife's best friend, today at Ziv's house. I didn't know him, but I see the people here, hear the eulogies, and hear the voices. "There's something that suddenly became clear to me in the wake of this cursed case," Hazan added, "It could be that our leadership isn't flesh of our flesh and therefore allows itself to act with restraint. The result is murder after murder that pass without proper punishment. "We hear the voices, see the pain, see the people; family after family torn apart. This is the People of Israel; it's us, each and every one of us," Hazan noted. "Someone told me that maybe it was because I buried Ari at the beginning of the month and Kim yesterday. They said maybe because I was emotionally involved that I say this. I think it's just the opposite; it's the emotion that opens my eyes more, the tears make the vision clearer. I simply believe that our leadership is disconnected from the Jewish People and doesn't understand how much this is a rift in the nation. We cannot afford more victims." "We hear that in the past few hours there's been a chase that cost tens, if not hundreds, of millions. I can't understand why no decision is made to close the village of Shweika - a village of murderers - to seal it. As long as we don't impose collective punishment, we won't solve the problem. And what about deportation? You don't want to expel to Syria or Iran and you say 'international law' - then throw them into Gaza: They themselves claim that Gaza is the same state and entity. So throw those scum out. Anyone who was close to the terrorist." Hazan notes that he himself submitted a bill to deport terror collaborators in 2015 and that the law is on the Justice Minister's desk. "A law that provides a response to the Supreme Court provides a solution to international law. It's time to apply it. The death penalty is too sweet a sentence, the death penalty is a gift. We have to eliminate the whole family and cut off terror because with terror you don't talk; terror you destroy."